Well summer is now over, and the weather definitely seems to have turned with cooler nights, shorter days and daytime temperatures not getting above mid 30’s. We have been fortunate so far to have had a quiet season and only a handful of callouts to support the Air Operations group. Our last incident was the fire at Jupiter Creek which had 4 aircraft fighting the fire and keeping us very busy with rapid turnaround. Evidently that fire was started by someone brush cutting so please remember to take care until the season breaks with good rains – who knows when that will be! We have a good team now, but are always looking for more locals who are in the district during the day time so if you’re interested, then please contact us through the Cherry Chatter group. This month the brigade has been continuing with training and station improvements, with just a few call outs along the way. At the time of writing, our area has had no major fire threats and this is obviously a great result. Thanks for all your efforts with good fire season practices and please keep up the good work. Although summer has passed, the following is from the CFS website and it may be worth keeping in mind. Ever wondered about the difference between “Bushfire Safer Places” and “Bushfire Last Resort Refuge” as designated by the CFS and local Government? A Bushfire Safer Place is a place of relative safety. It may be used as a place for people to stay in or as a place of first resort for those who have decided, they will leave high-risk locations early on a high fire risk day. These areas are relatively safe from bushfire because of low levels of fuel, lower ember/spark risk and access to government services. The closest CFS bushfire safer place to Cherry Gardens is the suburb of Aberfoyle Park. As part of your planning, consider travelling time, under what circumstances to relocate and what you will take. If you intend to relocate to a Bushfire Safer Place, you should do so early in the day. Last minute decisions to relocate in the face of fire are extremely dangerous. There are no designated Last Resort Refuges in Cherry Gardens; our closest is Waymouth Oval in Coromandel Valley. Last minute travel from Cherry Gardens to this location will be extremely dangerous and potentially not possible. The following may assist if you are travelling or working in another area. 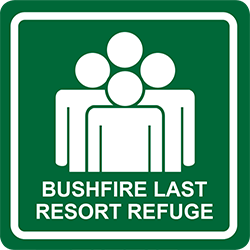 It is important not to confuse Bushfire Last Resort Refuges with the above Bushfire Safer Place. Bushfire Last Resort Refuges are your LAST choice of location to shelter from a bushfire. They are an area or building which you could go to and remain in during a bushfire. They are intended to provide a place of relative safety during a bushfire but do not guarantee the survival of those who assemble there. You should only use a Bushfire Last Resort Refuge when your personal Bushfire Survival Plans cannot be implemented or have failed. They may have limited capacity, subject to ember attack, no emergency services and no access to amenities. A Bushfire Last Resort Refuge is not designed to replace a personal Bushfire Survival Plan. Again, the above information is from the CFS website. We train every Monday night for those who may be interested in what we do. Below is a letter of appreciation for the recent donation made by Cherry Chatter Community Association.